Sixty care workers in the UK’s Bath and North East Somerset area have begun using NFC phones to log their visits to clients’ homes. 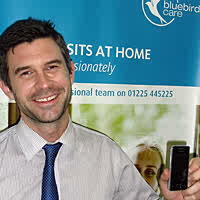 Bluebird Care is using Advanced Health & Care’s iConnect Service to record workers’ arrival and departure times at customers’ homes via NFC as well as to deliver real-time task lists and data to the care workers’ mobile phones. The switch to iConnect is expected to reduce phone costs by 10% and paper, printing and postage costs by 50%.